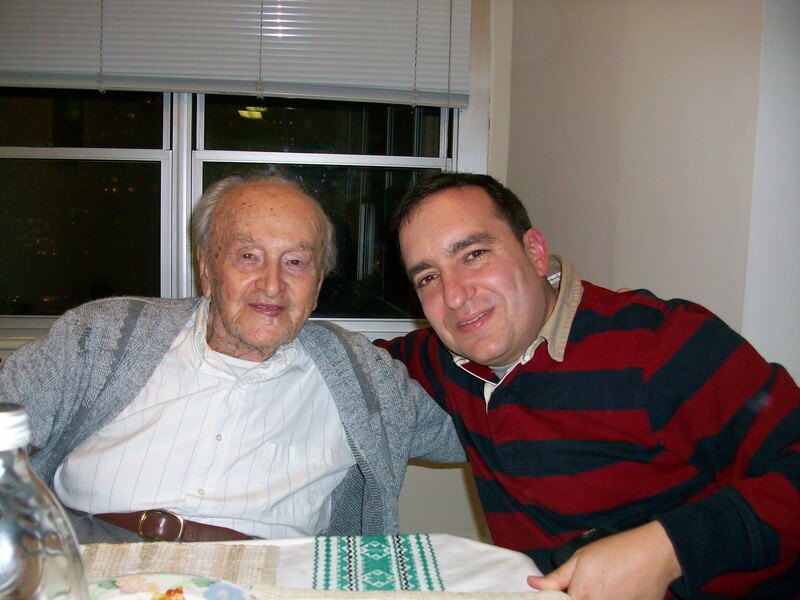 Tomorrow is my great uncle Bandi’s 100th birthday. When I mention to friends or neighbors that I’m traveling to Hungary to help him celebrate the occasion along with dozens of his friends and relatives the usual response I get is “Wow, you have good genes,” particularly when I tell them that he himself is traveling there for the party (he lives in Philadelphia now). Yes, living to 100 and being able to enjoy it, much less be cognizant of it, are nothing to sneeze at, but they are far down on the list of things I admire about Bandi. Centenarians are, of course, rare. There are about 55,000 of them in the United States or about two-tenths of a percent of the population. It is rarer still to be a 100 year old man as the female-to-male ratio is 3.9 to 1 and probably even rarer to be in such good shape and able to live alone. (If you’re looking for health tips then avoid exercise, eat plenty of pastries and drink lots of Zabar’s coffee). Bandi, who is the first cousin of my mother’s father Lászlo (who was murdered by the Nazis in Dachau), has led an impressive life. His educational opportunities limited by harsh anti-semitic laws in Hungary in the 1920s and 1930s, he started a family and his first child was born during the war. He was active in anti-fascist circles and was put into a forced labor detail building runways for the Luftwaffe. As he put it, no airplane was going to be able to land on the rutted clearings he helped build. One day a fellow prisoner, a pharmacist, offered him a pill to end his life. Bandi, who was and is a survivor and an optimist, refused and later escaped. After the war Bandi was wise enough to see that nothing good would come from Soviet occupation so he headed to one of the few countries that was accepting immigrants at the time: Colombia. With no money or knowledge of Spanish, he worked in a textile factory and then as a traveling salesman before saving up to bring his family over. Through hard work and business acumen, he became the owner of a prosperous textile manufacturer. Over the years, as Colombia became unstable and violent, he and his three children from two marriages (the oldest is a year younger than my mom, the youngest a year younger than me) have wound up in different parts of the United States. Bandi has been retired for nearly as long as I have been alive but he remains more active than most adults half his age. A lover of theater and opera, he has seen more performances than most anyone and made sure to arrive in Hungary early enough to see several shows before they closed for the summer. He speaks and reads several languages and is online constantly. When he tried to shut down his AOL service some years ago he was begged to stay with the company as he was the most active subscriber in Florida. I receive one or two emails from him weekly with interesting articles or videos and I forward my own columns to him (he actually reads them). It is hard enough being middle-aged and remaining upbeat in a world full of tragedies. Having lived through two World Wars, the Holocaust and the Cold War and being old enough that not just the generations before him but his contemporaries and many of those decades younger than him are alive only in his memories, Bandi looks forward to the next day. I never hear him complain or even talk about himself much – he’d much rather discuss his children, grandchildren or extended friends and family spread over three continents. He is the glue that holds many of these people together and always seems to know either directly or through the grapevine where everyone is and what they are doing. In turn, it’s not hard to see why all these people stay in touch with Bandi: he’s a great guy – funny, wise, kind and erudite. So, yes, I have good genes. This entry was posted in Uncategorized and tagged centenarians. Bookmark the permalink. Spencer, What a great tribute to your Uncle! Enjoy the celebration and tell him that your New Jersey friends wish him a Happy 100th. Travel safely.